Available on the Kitsap Peninsula outside Seattle. Classes available online through the Fenzi Dog Sports Academy. Shade offers workshops and seminars across the U.S. Shade has been training and competing in dog sports since she was a kid. 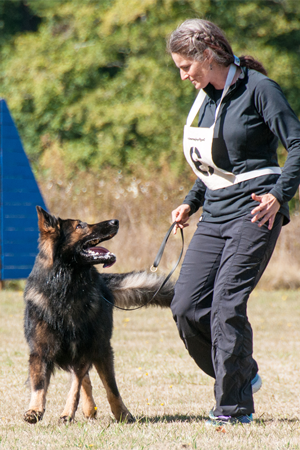 She has always been interested in how dogs learn (she has run a successful dog training business since 1994) and has competed in IPO/Schutzhund, AKC obedience, and French Ring. Her retired dog, Reiki vom Aegis, IPO 3, FH 1, French Ring 1, CDX, was 5th at the 2010 AWDF Championships, 7th at the 2012 AWDF Championships, 1st at the 2011 Northwest Regionals, and 2nd at the 2012 Dutch Shepherd Nationals. Reiki is now almost 11, and Shade is currently competing with his son, Ones. Ones just earned his IPO 2 with scores of 99 in tracking, 95 in obedience and 96 in protection. He looks likely to follow in his dad’s footsteps!